I've been trying to buy fewer books this year. With a TBR-mountain in the 400+ range I really need to get to the books I already own. I've been largely successful, but I simply can't resists a good sale. A local online store had an offer where you got a 40% discount if you bought 3 books. 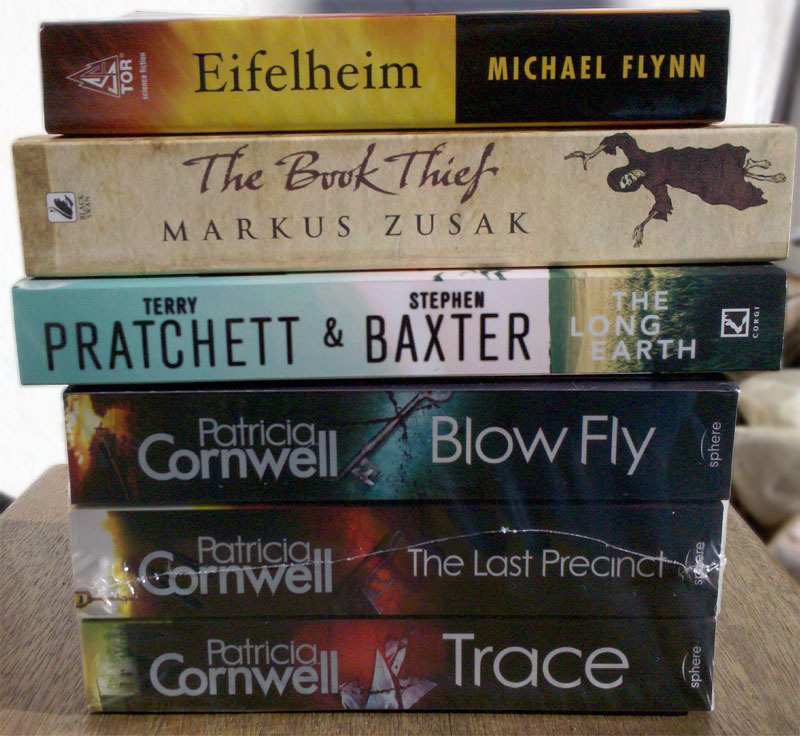 I only really wanted one book, but ended up getting a total of six! I also received two books for review. The Lowest Heaven is a thing of beauty. I haven't read it yet, but the beautiful cover alone makes it worth having. 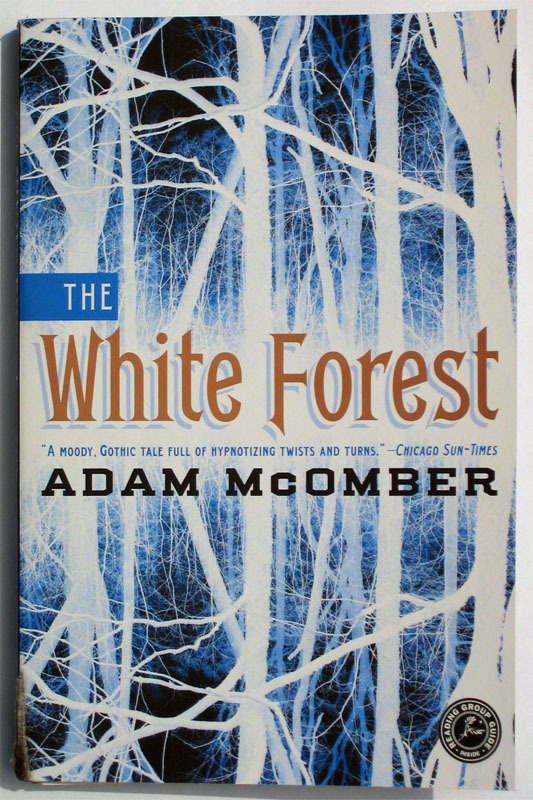 While I don't normally read books set in the Victorian era the premise of The White Forest was too intriguing to pass up. 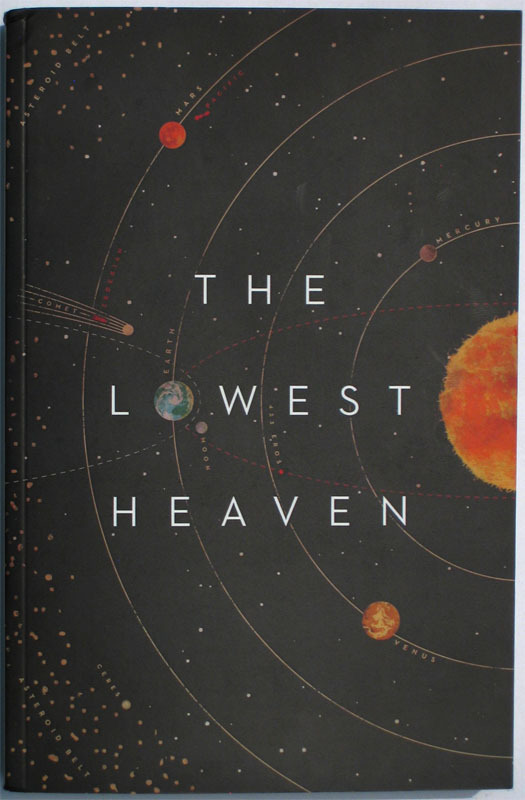 The Lowest Heaven is a new anthology of contemporary science fiction published to coincide with Visions of the Universe, a major exhibition of space imagery at the Royal Observatory Greenwich. 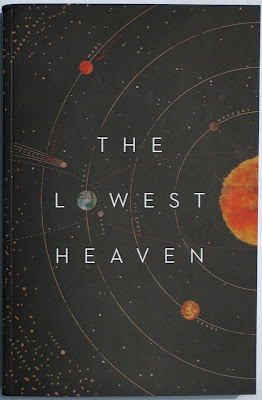 Each story in The Lowest Heaven is themed around a body in the Solar System, from the Sun to Halley's Comet. The stories are illustrated with photographs and artwork selected from the archives of the Royal Observatory, while the book's cover and overall design are the work of award-winning South African illustrator Joey Hi-Fi. 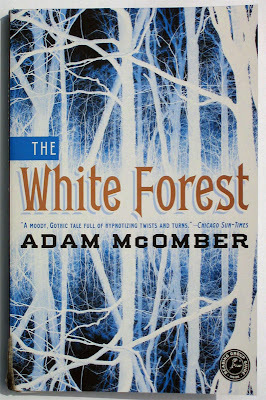 The White Forest by Adam McOmber is full of fantastical twists and dark turns which transports readers to a unique and memorable world. Jane Silverlake is a lonely young woman with a strange, inexplicable gift – ever since her mother’s mysterious death she has been able to hear the souls of man-made objects. Nathan’s fascination with Jane compels him to understand her odd talent—sparking interest in a secretive cult led by Ariston Day. Suddenly Nathan disappears from the streets of Victorian London. In order to save everything she must infiltrate Ariston Day’s mysterious secret society, leading Jane to a place beyond her wildest imaginings that will reveal vast reserves of power and strength within her she never dreamed she possessed. People have been predicting the end of the world almost from its very beginning, so it's only natural to be sceptical when a new date is set for Judgement Day. But what if, for once, the predictions are right, and the apocalypse really is due to arrive next Saturday, just after tea? You could spend the time left drowning your sorrows, giving away all your possessions in preparation for the rapture, or laughing it off as (hopefully) just another hoax. Or you could just try to do something about it. After reading the entirety of the Discworld series I found myself with a distinctly Pratchett-shaped hole in my life. The Discworld books are my solace, my escape to a whimsical reality and a sure-fire cure for all worldly ills. What was I to do now that I had read them all? * While compiling an extensive catalogue of all my bookish possessions, as all bibliophiles are wont to do, I stumbled upon a hitherto unread copy of Good Omens co-authored by Terry Pratchett and Neil Gaiman. As I took it from the pile on my shelf I was overcome with joy, a heavenly light shone from above and angels rejoiced in song. ** I had found my next read. Thank heavens/hells for a large TBR-mountain! Good Omens is a story about the end of the world, but it’s not quite the Armageddon you might be expecting. For something based on an ineffable plan nothing seems to go quite as expected. Aside from the Four Horsemen of the Apocalypse and the hosts of Heaven and Hell, nobody else seems to actually want to allow it to happen, not even the Antichrist himself! A wacky adventure ensues as the most unlikely cast of characters try to prevent the end of times. I won't say more than that since discovering who teams up together, how their paths cross and what they are up to is half the fun. I was engrossed in the story; completely captivated by the characters and their escapades. I giggled merrily to myself at the funny bits, but I was also deeply touched by the uncomfortable truths brought to light. While Good Omens might appear to be a fluffy read it has a much deeper philosophical side. Using wit and humour it deftly explores the human condition and some profound issues like nature vs. nurture, good vs. evil, the fallacy of religion and the question of free will. Shoehorning in a reference to 1984 the ending is satisfyingly apt; full of promise and possibility, just as life should be. If you had to highlight all the funny and profound bits (not to mention the profoundly funny bits) you’d end up with an edition swimming in a sea of neon. 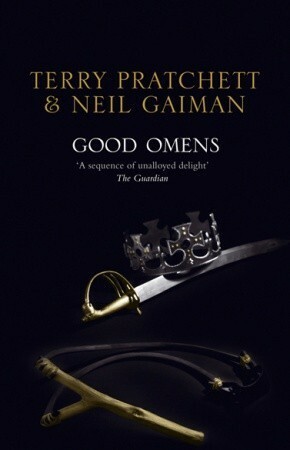 Terry Pratchett and Neil Gaiman are great authors in their own right, but as co-authors they are utterly brilliant***. Good Omens might have been written at the start of their respective careers, but it’s every bit as good as any of their more recent work. * Aside from, obviously, waiting for the next one to be released. Said release being Raising Steam scheduled for release in October of the year 2000 and 13. ** Not a true account of events, but it seemed thematically appropriate. In actual fact I had hit my head on a shelf after toppling my reading lamp. The joy, however, was real. *** On a brilliance scale starting with the output of a single candle and working your way up to the really bright stuff they’d rate somewhere close to a nova. Good Omens is a hellishly funny read that will have you laughing out loud into the wee hours of the morning. It’s full of wit and humour, but also hides a more serious side. Some people might not ‘get it’, but if you are a fan of Discworld you’ll love every moment of it. I definitely did. Highly recommended! Thanks to Lynsey Dalladay from Transworld for providing the review copy. It's been more than two years since I last posted an ebook pricing comparison. A lot has changed since then and I'm glad to report that the ebook market in South Africa has improved considerably. 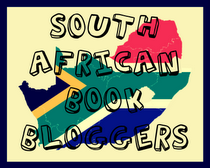 We now have two local online retailers offering ebooks: Kalahari.com and Exclus1ves.co.za. The biggest change has to be the entry of Kobo into the local market. Together with Pick 'n Pay they've introduced their line-up of eink readers to the country at prices that compete favorably with the Kindle (one of the few locally available eink devices) and they've also launched a localised version of their online store offering a huge selection of ebooks for purchase in South African Rand. The user-experience of the Kobo store is similar to that of the Amazon Kindle store with purchases being delivered automatically to your device over Wi-fi. Geographic restrictions seems to be less of a problem. Most of the ebooks I'm interested in seem to be available and the overall quality of ebooks have also improved considerably (you even get those fancy covers included nowadays!) and some publishers (most notably Tor) have opted to provide their ebooks DRM-free. Aside from one title Kobo consistently had the cheapest prices on offer. For new releases the price difference between Kobo and Amazon seems to be relatively small, but on older titles prices at Amazon were considerably more expensive. Our local retailers can't seem to compete with the international sites. In total they were much more expensive than Kobo and Amazon, but on a few titles Exclus1ves were slightly cheaper than Amazon. Kalahari turned out to be the most expensive option out of all the stores. Using the prices from Kobo as baseline Kalahari was 60.75% more expensive, Exclus1ves 46,07% and Amazon 20.58%. The prices don't take any special offers into account. The Kindle store offers daily deals and tend to discount certain books from time to time. However, from my limited experience, it seems most of the daily deals tend to be restricted to the US. They also seem to add an extra $2 charge on some discounted titles to cover the 3G delivery (even if you don't own a 3G Kindle). Kobo also has special offers and in addition they give out promo codes that reduce their prices even further. These discount codes range from 10% to 85% and, for the most part, seem to be usable on any ebook (unless specifically stated otherwise). Exclus1ves has a loyalty programme where Fanatics members earn 5% of their purchases back. They also have a discount incentive called Stickers where you can earn discounts of 10% - 25% to use on products of your choice. When deciding on an ebook reader it's important to compare the prices of the ebooks you are likely to read and see which stores offer the best prices. It definitely pays to shop around! I thought it would be a fun project to do a complete catalogue of all the fiction books I own. Armed with a book cataloguing app I set to work and diligently scanned barcodes or entered ISBN numbers like a fiend. The initial plan was to finish the entire process during a single weekend, but it took a tad longer than I expected. I managed one entire bookcase before I ran out of steam; 270 books and I wasn't even at the halfway mark. Over the last week I managed to tackle the book piles scattered throughout my room and the rest of my bookcases (thankfully much smaller ones). The end result is that I now have a reasonably complete catalogue of my book collection and lots of interesting bookish data to play around with. Aside from the fact that I seriously need another large bookcase the results were quite interesting. I own a total of 560 books by 164 different authors. Of those a whopping 76% (425) are still on my TBR-pile (this includes books I want to reread so the number is slightly inflated. When sorting the books into genres it's extremely clear where my passion lies. Science fiction beats out all the rest by a huge margin. I was surprised that I own so few horror novels since it's a genre I really enjoy. The rest are pretty much as I expected with the 'Other' category acting more as a catchall for the books I couldn't define as a specific genre. I might refine the classifications at a later stage, but it's accurate enough for now. 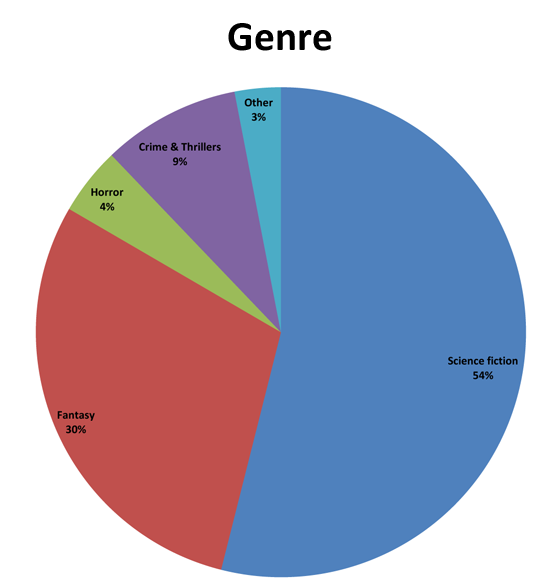 The numbers for the different publishers and imprints are a bit of a mess, but at a glance titles from Tor seem to be the most popular followed closely by Orbit and Gollancz. No surprises there. There is a good chance that if you like to read sci-fi novels you will be, at the least, partially inclined to watch sci-fi movies. With feature length movies like District 9, Avatar and Looper getting all the hype it is easy to overlook all the cool sci-fi short films that have been released over the last few years. And that would be a real shame. They might only fill one lunch break, but these twelve short films impress and delight with their special effects and the strange worlds they conjure. An Isreali short that looks impressively polished and gives us a realistic and slightly scary look of a life enhanced with augmented reality. Sad and depressing. A robot tries to save a man from killing himself. Based on the opening chapter of the 2007 novel Red Men by Matthew De Abaitua. A funny movie about a device that tampers with the speed objects are moving. Witty dialogue and use of special effects. Portal fans will especially like this one. Despite the rather silly sounding title this short manages to be surprisingly emotional. A short about a military robot developing a conscience. Impressive special effects and there is a good chance that this one will be made into a feature length movie. A Dutch animation production about a girl and her friendship with a dragon. Only fifteen minutes long but long enough to tell a beautiful and sad story. This is one creepy movie. A tale about a boy and his abusive relationship with his toy robot. A story about ecological degradation and irresponsible corporations. This one is heavy with special effects, but it's the locations that have been used to shoot the movie that makes this uncomfortable to watch. No special effects whatsoever. Instead this is a tightly plotted movie about ill-intentions and office politics. About halfway through Star Trek fans will get a pleasant surprise. Don't watch the movie for it's story. A bunch of Goth androids beating the crap out of each other. That's it. But what a feast to behold. Stupendous animation and it's all the more impressive if you consider that this one was a one man production. It takes a special kind of movie to make a story about a guy stuck in one room interesting for over 10 minutes. Vacuity manages that and it is a reminder to us all that updating your OS can be a downright matter of life and death sometimes. As a bookseller I have a soft spot for this one. Low on special effects it manages to conjure a future in which people can no longer enjoy the simple pleasure of opening a book or creating their own story. Bittersweet. This list was compiled by Tiemen Zwaan, the Sci-fi & Fantasy buyer at the American Book Center in Amsterdam, the Netherlands. He feels very fortunate to have a job that basically lets him geek out for a living. When not working in the bookshop or reading a book, he teaches the occasional political science class at the University of Amsterdam. You can follow him @tiemenzwaan. Feel free to ask for recommendations or pictures of his cat Charles. Orbit has unveiled the cover for Ancillary Justice by Ann Leckie. If it lives up to the promise of being 'space opera on par with Peter F. Hamilton and Iain M. Banks' then this is definitely a title to look forward to. A warship is destroyed but her artificially intelligent mind remains in a single human body – why was she destroyed and will she find revenge? The Radch are conquerors to be feared – resist and they’ll turn you into a ‘corpse soldier’ – one of an army of dead prisoners animated by a warship’s AI mind. Whole planets are conquered by their own people. 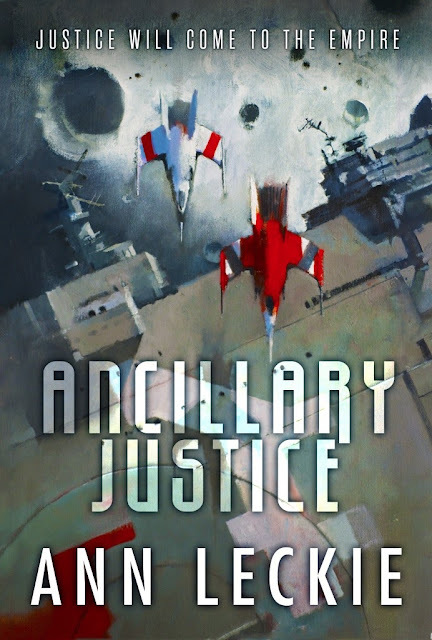 The colossal warship called The Justice of Toren has been destroyed – but one ship-possessed soldier has escaped the devastation. Used to controlling thousands of hands, thousands of mouths, The Justice now has only two hands, and one mouth with which to tell her tale.